It’s here! Seven years in the making and now it’s a beautiful book, 224 pages strong and 805g heavy. Once again it was a very special journey, this time mostly due to the incredible artists and people I was able to meet and then collaborate with along the way. Thank you very much to everyone involved, but especially to the phantastic Georgian photographers Dina Oganova, Giorgi Shengelia, Guram Tsibakhashvili, Natela Grigalashvili, Tinatin Kiguradze, Vakho Khetaguri and Yuri Mechitov for buying in to the idea and for their willingness to participate and share their stories. To the amazing writers Ana Kordzaia-Samadashvili and Dato Turashvili for being open to the direction of our project and enriching the visual stories with their words. To my friend Giorgi Tabliashvili, who is not only a gifted artist, but also contributed an essay and helped me gain a better understanding of Georgia through our countless discussions over the years. And to his mum Marina Tabliashvili for welcoming me into their home – she just makes the best Khachapuri. Then there’s Otar Karalashvili, who I met at exactly the right time when I thought about who I wanted to work with on the execution of the book. He’s a master art book designer and it was a great pleasure working on – and fighting about – the book’s concept, design, editing and everything else that happens in the process of bringing it all together. Not to forget: there’s Myriam Grigalashvili, who provided invaluable input and help in the communication process. Sybilla Heinze who translated all the Georgian essays into a brillant German version, Natalia Buka-Peters and Charlotte Marsden who did the same for the English version. And Heike Bleitner and Patrick Van de Wille who helped us with their copy editing skills. Alex Berdysheff and Nino Keshelava – thank you for your friendship, for opening your world and doors for me, for sheltering me more than once. Last but not least, thank you to our supporters, institutional or private, for their help in making this idea become a real book, especially the Georgian National Book Center with Irine Chogoshvili, who always was a patient and positive facilitator along the way. 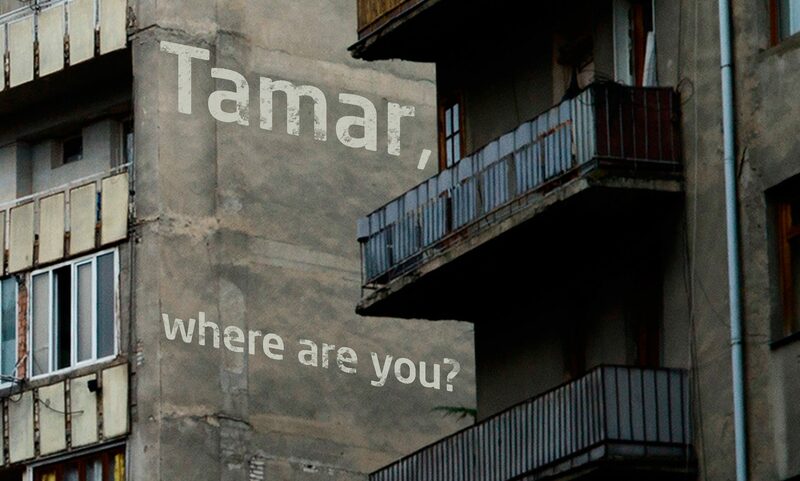 And now I can’t wait to get „Tamar, Where Are You?“ out and share our stories about Georgia with the world. It’s in the news section and introduces Georgia as a travel destination, nevertheless, our book is featured, so this is fabulous news! Yuri Mechitov had his first photography exhibition in 1979. Ever since, he has been one of the most distinguished authors in Georgian photography – and a witness in what must have been the most tumultuous times in recent Georgian history: the end of the eighties and beginning of the nineties of the last century. In „Tamar, Where Are you?“ he’s sharing his impressions of this period. From desert to palm trees, mountains to plains – it’s amazing to find so many different topographies in such a small country. When you travel to Georgia for the first time, you will undoubtedly hear the story about how Georgians ended up on this beautiful land. There are different versions, but the idea is, that, when God divided the earth into countries, he called out for all people to come and stake their claims. Once all was set and done and God wanted to relax, he discovered a man resting under a tree, who didn’t take part in the hustle and bustle before. When God asked him why he wasn’t interested in a homeland for himself, the man replied, he was happy the way things were and that he would be content with whatever God had in mind for him. Impressed by the friendliness and effortlessness, God offered him the paradise he had reserved for himself, which then would become Georgia. Tagveti (“Village of the Mice” in English) is where Natela Grigalashvili was born and raised, and Village of the Mice is a personal project about memories of her village as it used to be. She left when she was 16, two years later she started photographing with a borrowed camera, and since then she has been photographing her village. Natela Grigalashvili is one of the outstanding Georgian photographers sharing stories in Tamar, Where Are You? – and Village of the Mice is her story. A book like „Tamar, Where Are You?“ always is a journey, from the first images to the idea to the finished product. And one never succeeds without the right traveling companions. For Tamar, we are lucky that we were able to already find some great supporters like the Georgian National Book Center, but there’s still quite a distance to the finish line, so we just started our crowdfunding campaign on Indiegogo. Have a look and maybe we can spark your interest – or you would like to spread the word and share the campaign, so that we can reach as many people as possible with our book.